At first glance, they seemed out of place, like when basketball great Michael Jordan played minor league baseball for a season or when MMA champion Conor McGregor stepped in a boxing ring against that sport's best, Floyd Mayweather. There was the trainer of the Breeders' Cup Classic winner putting on a show coat like an Olympic equestrian. There were the racing broadcasters riding the horses instead of talking about them. And there was the Grade 1-winning racehorse that's moved on to show jumping rather than resting on the laurels of a successful racing career. But what December's CARMA Calcutta at the Los Angeles Equestrian Center in Burbank, Calif., showed is that the racehorses and the people that shine 20 miles away at Santa Anita Park and around the country at other racetracks are quite adept at a second sport. The CARMA Calcutta is part of the larger Thoroughbred Holiday Classic Horse Show. It's organized by the California Retirement Management Account (CARMA) to raise money and awareness for the work it does with retired racehorses. There's a magnetism that draws the racing community back to support their horses in this event and others like it. The Thoroughbred Makeover presented by Retired Racehorse Project at the Kentucky Horse Park has also become a source of pride for racing connections to reunite with their horses. Pat Chapman, best known as the owner and breeder of 2004 Kentucky Derby and Preakness winner Smarty Jones, gushed that a horse she raced was in the show jumping finals. The Thoroughbred breed, whose ancestry dates back to three foundational sires based in England in the 17th and 18th centuries, was developed predominantly for and has historically excelled mostly in racing. However, the breed has also made waves in the horse show world, such as with Touch of Class (racing name Stillaspill) winning show jumping gold medals with Joe Fargis at the 1984 Summer Olympics, coincidentally held at Santa Anita, and the multiple United States Dressage Federation horse of the year and Olympic competitor Keen (racing name Willoughby) with rider Hilda Gurney. 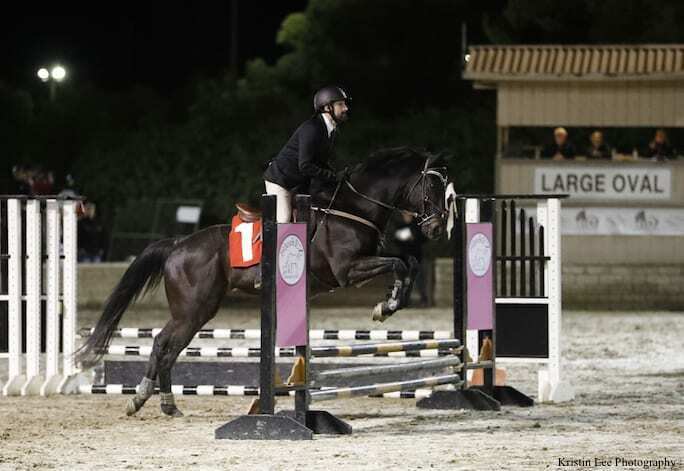 Partially in response to a decline in the popularity of using Thoroughbreds as sporthorses because of the surge of Warmbloods, CARMA began the Thoroughbred Classic Horse Show Series in 2013. To make it more than a horse show after starting the series, the Trainer-Jockey Calcutta was first added to its December show that year. Teams of trainers and jockeys competed with the former racehorses around a 2-foot jumper course. “It was my idea to do a class that could somehow bridge the gap between the racing world and the horse show world,” said CARMA president Candace Chew, also director of prints & graphics at Santa Anita Park and wife of trainer Matthew Chew. The racing world got to see their horses in a new light, and the show horse world got to see the racing people out of their element. One of those jockeys was multiple stakes winner Edwin Maldonado. “We had to physically hold on to him, or he was going to bolt,” Chew recalled. “When he entered the ring, it was so funny. He had a death grip on that horse's mane with both hands and had the reins somewhere in there. He basically sat there, and the horse went forward. And he hung on for his life. “He got over the first jump, and you could see the horrified look on his face turned into kind of a half-grin. And the second jump, he was able to loosen his death grip a little bit. And by the third jump, he was riding like he'd ridden a course every day of his life. On the other hand, some racing connections seemed right at home jumping their horses. Before he ever had ambitions of winning Grade 1 races, including one of the most prestigious with Accelerate in the 2018 Breeders' Cup Classic, trainer John Sadler had ambitions of being on the Grand Prix jumper circuit and qualifying for the Olympics. “Show horses were kind of my first love,” Sadler said. “I feel if I hit the lottery, I would go buy an expensive show horse,” he added with a chuckle. Saying he grew too big to ride hunters and jumpers, Sadler switched to training racehorses, winning his first horse race in 1979. Riding in the CARMA Calcutta, which he has done every year the event has been held, gives him the chance to dust off his tall boots and show helmet. In addition to the initial teams of jockeys and trainers, teams that included exercise riders were added in subsequent years, as was a team of horse racing broadcasters for the first time in 2018. It was the broadcast team that got me to the event and put myself, Ashley Gubich, Ron Ellis, and Megan Devine on horses instead of filming and talking about them. Gubich also retrains Thoroughbreds for the aftercare organization CANTER Colorado. Devine, who has show experience in the hunter-jumper world, including as a captain of the equestrian team at the University of Louisville, helped recruit riders and put the teams together. I rode Georgie Boy, a former Grade 1 winner that earned $788,634 in Southern California. Riders have about 10 minutes to get acclimated to their horse before going in the show ring. I watched one of his stakes replays from 10 years ago before hopping on, and that made me appreciate the power and grace of the big bay even more. Chapman said she brought a trophy Cheyne of Events won for a victory on the racetrack to the Thoroughbred Makeover to give to the horse's new rider and trainer, Erica Eggert, as a symbolic passing of the torch. And, the winner of this year's Thoroughbred Makeover, Reloaded and four-star eventer Elisa Wallace, were honored in the winner's circle at Keeneland the day after the event and at the Breeders' Cup. If events like the CARMA Calcutta and the Thoroughbred Makeover are “so much more than a horse show,” like Chapman and many racing connections experience, then the Thoroughbred represents more than a horse. “It's a larger picture than some people realize, and there's more people in the racing industry now that have a more educated perspective on what that term aftercare truly means,” said Jen Roytz, executive director of Retired Racehorse Project. It's what keeps the connection going between horses and the people that raced them, highlights the versatility of the American Thoroughbred, and even gets jockeys, trainers, and broadcasters out of their comfort zone because of their love of the horse. 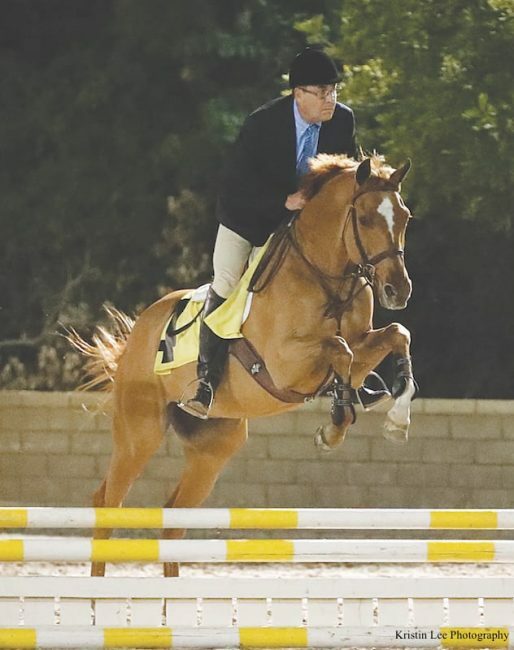 This entry was posted in Aftercare Spotlight, Horse Care, NL List and tagged Aftercare Spotlight, candace chew, CANTER, carma, carma calcutta, edwin maldonado, Jockeys, john sadler, Jonathan Horowitz, megan devine, Thoroughbred aftercare by Jonathan Horowitz. Bookmark the permalink.